Designing an Effective Feed-in Tariff for Greater Los Angeles The study be found here. On April 6th, LABC held the 4th Annual Sustainability Summit at the Getty Center. Key players from the public and private sectors converged, making our Summit prescient and brimming with powerful ideas about, as the summit’s title suggests, Building a Green Economy: Connecting Sustainability to Business and Job Creation. A centerpiece of the Summit was the release of our Study, Designing an effective Feed-in Tariff for Greater Los Angeles (LINK UPDATED: Click for PDF). This study, the result of a partnership between LABC and the UCLA Luskin Center for Innovation, and a working group of local businesses and public-sector institutions, examines the potential for solar Feed-in Tariff (FiT) programs in Los Angeles County. The study details how a 500 megawatt FiT program in LA would allow businesses and residents to install solar panels on their roofs and parking lots and sell the power generated back to the local utility. For each kilowatt-hour fed back into the power grid, participants would receive a payment back from the utility. Relying on advanced economic modeling and interviews with businesses and residents in Los Angeles County, the study finds that regional FiT programs would unleash a new source of cost-effective solar energy and spur significant economic growth. The LABC policy recommends a 10 year Solar FiT that would generate 500 megawatts of electricity. This program would meet three percent of the city’s energy needs, create more than 11,000 local green jobs and produce long-term cost savings for businesses, ratepayers and the LADWP. From left: The Honorable Jerry Brown, California Attorney General; Lauralee Martin, Executive Vice President and Global Chief Operating and Financial Officer, Jones Lang LaSalle; Scott Lyle, Senior Vice President of Operations, GE/Arden Realty, Inc.; Kevin Ratner, President, Forest City Residential West; Joseph Pettus, Senior Vice President of Fuel and Energy, Safeway, Inc.
Joseph Pettus, Safeway’s Senior Vice President of Fuel and Energy, described Safeway’s path to sustainability from the purview of a company that is one of California’s largest employers and the largest consumer of electricity in the state. Pettus explained that Safeway was one of the first organizations to support AB 32 as well as support cap and trade. They reduced their carbon footprint by more than 10% in just a year, and changed their truck fleet to biodiesel fuel—all this was done to lower costs. Lauralee Martin, Global Chief Operating and Financial Officer, Jones Lang LaSalle reflected upon her “long passion for the environment” and described key questions her company asks with regards to sustainability (whose footprint should we measure – the consumers’ or the producers’?) while identifying the challenges and opportunities when it comes to sustainable business practices. Focusing on key words, “Passion” and “Confusion,” she illustrated how passion relates to the fact that people care and confusion relates to the fact that being a leader in sustainability requires you to do things that have not yet been done, meaning success might not be easy to measure. CLICK HERE to see video of Jerry Brown’s remarks! The second panel, moderated by Mary Nichols, focused on incentives for implementing renewable energy. The conversation among this group of public and private sector experts touched upon the need for, as Councilmember Paul Krekorian put it, “market driven policies,” and each offered observations from their diverse perspectives as private and public leaders in the field of sustainability. Paul Gipe, Founder, Wind Works,and an expert in renewable energy, explained the need for big solar goals and the importance of community involvement and education on the issue (See Gipe’s report on the Summit and the LABC Solar Study here/ and his NYT story on our FiT Study). Steve Hill, President, Kyocera Solar, spoke from his experience as the President of Kyocera Solar, a manufacturer of photovoltaic solar panels, describing the importance of keeping manufacturing close to the market and the importance of flexibility and transparency in business and in policy. Alan Rothenberg, President, Board of Airport Commissioners, Los Angeles World Airports, led this broad discussion with a diverse panel of green business leaders by explaining the incredible progress made at LAX with the Tom Bradley Terminal that will be LEED certified , completed on time and on budget, and that also happens to be the largest public works project in LA. The panelists spoke of ways they have met the worthy challenges of green business, from Greg Maderios’ eco-conscious and sustainable development in Tejon Ranch, to Adam Warbach, Global CEO, Satchi & Satchi S’s call for us to rethink the prevailing approaches to environmentalism, rooted in 1970s thinking. Part of that relates to his client, Walmart (a perceived enemy of environmentalism in the past), and its incredible goal to eventually run operations on 100 renewable energy, produce zero waste, and have 100 percent sustainable products on their shelves. 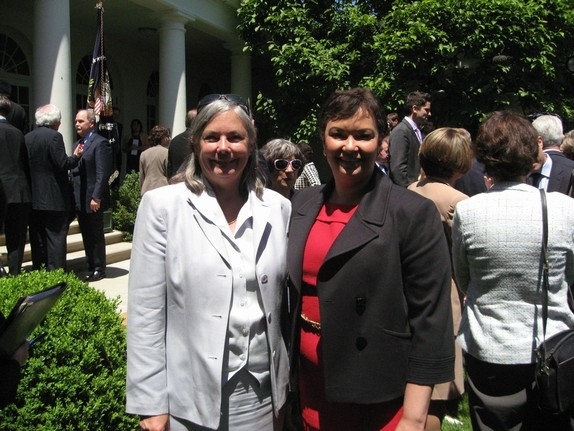 Senator Pavley with U.S. Environmental Protection Agency Administrator Lisa Jackson at White House announcement of new federal emission standard for cars based on Pavley’s bill. California’s 2002 law, AB 1493 by then Assemblymember Fran Pavley, (now Senator Pavley), allows California to enact and enforce emissions standards to reduce greenhouse gas emissions from automobiles. But we had to fight for that right. Since taking office, the Governor has aggressively pursued the enforcement of California’s 2002 law, AB 1493 by then Assemblymember (now Senator) Fran Pavley, which allows California, independent of the Federal Government, to enact and enforce emissions standards to reduce greenhouse gas emissions from automobiles. The state filed a lawsuit against the U.S. EPA in 2008 to overturn its decision denying California’s waiver request to enforce the state’s emission standards after the California Air Resources Board requested the waiver in 2005. The U.S. EPA granted California’s waiver in June 2009. For a complete chronology on the bill, Click HERE >>>.